Salford are riding on the crest of a slump at the moment. 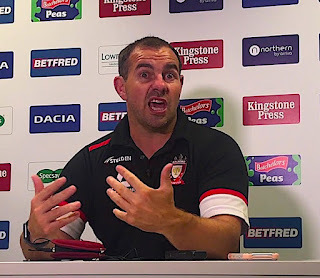 Four straight defeats has seen the Red Devils slide down the Super League Ladder to a heady 7th - with a worse points difference than bottom club Leeds. Ex-Hornet - and former tippy-toed half-back - Ian Watson is an unhappy coach. 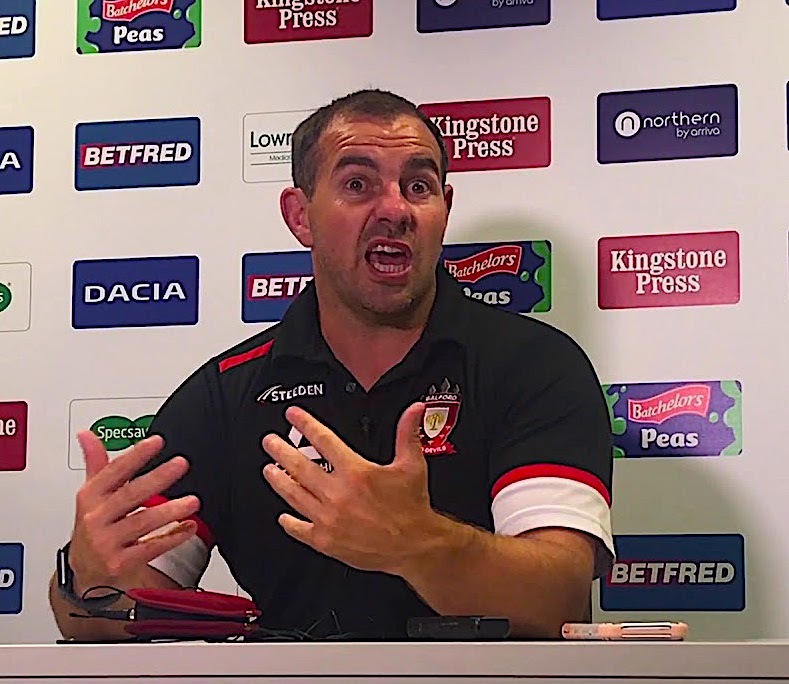 Speaking after his side's 23-6 home defeat to Hull, he envisages changes: "After that performance there will need to be changes," he said in the League Express this week. And he thinks the problem lies between his players' ears: "We need to re-shape; not the way we play, but some individual mentalities." Ooh, do name names, Watto: "... the guys who are playing should be taking their opportunities and not leaving me to make that choice. At the moment I feel like I have to make the choice and that's the problem. We have said the same thing over the last four weeks, We are not saying the same things again next week. We will be making changes." But who? Who's been idling around for a month? We need to know! Watson has been missing a few first choice names of late, but Junior Sa'u and Tyrone McCarthy should be back for Friday night's game. He's disappointed with his players, though: "They're a committed group, but we're desperately disappointed. We've come up against four big teams and we should have won the majority of the games. We're putting pressure on ourselves. We feel as though we're beating ourselves at the moment." Excellent, long may it continue. If only we knew where it was all going so terribly wrong. "We're not starting games well, and good teams don't let up in patches of the game. We're our own downfall and we're lacking experience in certain areas, as well as composure." As if that's not enough, over in UKIP's preferred RL read 'League, Weakly', Watson also revealed: "We are not building enough pressure on the opposition goal line and it's coming back and biting us." He went on: "It's the same old same old. We are talking about errors and poor discipline (they lost the penalty count 7-9)." "They held the ball, we didn't hold the ball enough once we got into those right field positions, especially in the first half when we bombed a couple of chances and they went down to 12 men." There's never really a good time to catch a Super League side, but this does sound like a Salford outfit foundering in the grip of a confidence crisis. Which we are delighted to hear. Hornets go into this tie on he back of a curate's egg of a performance against a pretty ordinary Halifax side. For 50 minutes, Hornets matched the visitors and showed decent resilience, before the game slid almost imperceptibly out of our reach. But if we can maintain a good level of performance more evenly over the 80 minutes and Salford continue to wobble, who knows? We think that the miracle is unlikely to happen - but we've seen Rugby League miracles happen. Ultimately, it'll be good to see Hornets go round at the AJ Bell - even though it means navigating the bloody M60 on the first Friday night of the Easter Holidays. Whoever came up with that one needs pulling through with a pineapple. We're pretty sure if we'd've played it at home on a Sunday at 3pm we'd get a bigger crowd. But we are where we are. Get there if you can - there a few Hornets fans getting together in the main/AJ Bell stand, so let's fly the flags, make some noise and get behind the lads.